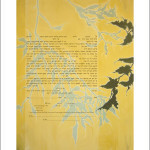 This painting was based on the artwork I designed for my son's wedding invitations. it is meant as a blessing, & an embrace. 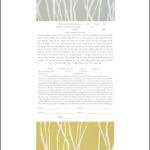 Dawnings – This new print is from a beautiful series of linocuts by Jill Sykes. 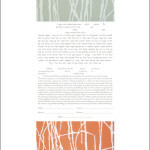 These images originally came from some tall raffia-like grasses seen through a window. 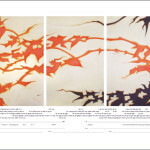 they became a series of several paintings as well as reductive linoleum prints. 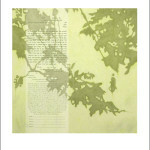 Paradise- This new print is from a beautiful series of linocuts by Jill Sykes. ‘The bird of paradise alights only upon the hand that does not grasp’, goes the old saying. 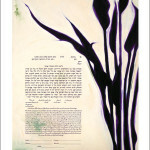 This lush ketubah image of the bird of paradise flower is simple but powerful. 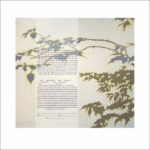 Prana – This new print is from a beautiful series of linocuts by Jill Sykes. Grasses blow in the wind, the breath of life flows from one beloved to the other. 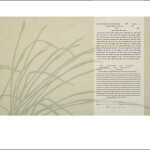 This ketubah radiates serenity and harmony. This painting was beautifully described by a dear friend as like being in a dream, hence the name. Rustling leaves in a spring breeze. A songbird somewhere celebrates your day. 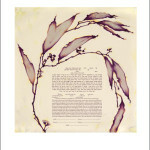 This ketubah is serene and lovely. 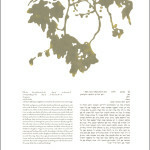 Sycamore Ketubah – This new print is from a beautiful series of linocuts by Jill Sykes. Shots of gold touch throughout the leaves, rich but elegant. 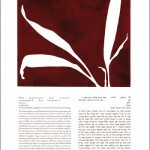 Adagio Ketubah by Jill Sykes, linocuts – formerly known as Cordova Relief – Rich Red background provides a stark relief to the graceful plant shapes.